SCG (Thailand) Co. Ltd., one of Thailand’s largest conglomerates, is committed to the idea that organizational and employee development helps drive innovation in products, services, processes, and business models. SCG partnered with Wharton Executive Education to deliver an executive education program that would prepare high-potential talents for management roles inside the company. The program was designed to enhance participants’ ability to respond quickly to global manufacturing industry challenges like process improvement, cost management, and changing import/export regulations. Sustained Success: The program has run successfully each year for 20 years. year across five core businesses: SCG Chemicals, SCG Paper, SCG Cement, SCG Building Materials, and SCG Distribution. Cost Savings: Project solutions have generated considerable cost savings for the company. 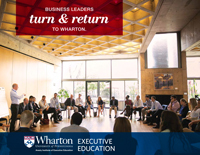 Business Management: By leveraging the skills acquired in the Wharton Custom program, participants contribute to the company’s growth as well as to bottomline growth inside each business unit. Strong Talent Pipeline: Succession planning is far easier now that SCG has a like-minded group of strategic leaders in the talent pool. 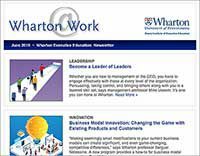 To find out how Wharton Executive Education can help your company achieve its own customized solution, please contact Alyssa Greco Stahl, Director, Client Relations — Custom Programs, +1.215.746.8093 or customprograms@wharton.upenn.edu.